Its always good to play against someone who "sticks to their guns", consistently playing ( and believing ? ) in the same openings : you can look forward to a testing game. In GM terms, a clear example must be Sveshnikov with his c3 against the Sicilian, and the same man with the Sicilian "Sveshnikov Variation" against 1.e4 ! I have no idea if my opponent is quite so principled as Sveshnikov in his chess beliefs, but he does seem to stay with the Caro-Kann against 1.e4, so when facing him. it gives me a choice of sticking to main lines ( and probably his better preparation ) or going with something different. 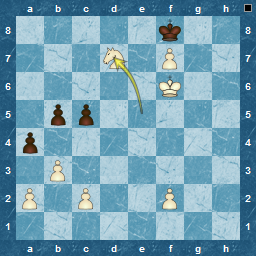 What appealed to me about the variation in question, was that it didn't seem like the normal Caro-Kann style, plus it has a long-castled king, something I am used to in other openings that I play. 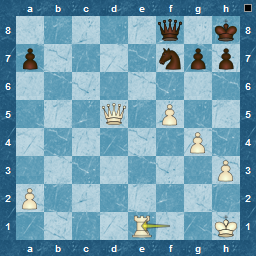 I had in mind a king-side pawn attack, with the likelihood that Black would attack on the queen-side. Who would be quickest and most effective, is the question usually posed in such situations ? Team League T51 has reached the playoff stage, but Magnum Ignotum are not there, having ended in third place in their section (congratulations to Scotch Yeti, whose team makes it again ! ). Personally, my record this time is +3=0-5, that's 37%. Not the best, and less than my overall TL record of 50%. Teacher's Report ? Could do better ! The Sicilian twice, one of them heavily questioned by an attack against my Queenside castling that just ran out of steam, collapsing to the counter-attack, and the other almost lost in the opening, but due to Blacks' passive play I managed to fight back to equality finally losing to a missed game-winning check-fork ! The French twice, both wins, one decided in the middle-game with Black over-looking a White capture that gives check and loses him a piece, the other an endgame grind, and most enjoyable, even including the psychological time tactics of my opponent. In both cases, I avoided mainline French lines with the fun-filled Réti Gambit. I really don't like the French ! A Caro-Kann completed the roster, where my timidity proved my undoing, missing a neat pin in a counter attack, and putting me on the back foot unnecessarily. I missed the correct response, going on to lose. As Black, twice I had long games in the Spanish losing one in a Rook and pawns ending, and in the other, again a timid plan lost me the initiative and the game. Lastly, a Centre Game as Black was lost after I was surprised by an attack and just did not stay calm enough to give a good defence. I really should have done better here, and of all my losses, this one bugs me. Conclusions for next season are evident. How does my openings experience compare to Team League overall ? This weekend, I reached 1000 games of chess played at ICC. Not 1000 standard games, but all sorts if chess, so a large number of blitz and only 96 long games, mainly in Team League. My 1000th game was a loss. An early mistake, but with some compensation where the back-and-forth of the game gave me another chance. Sadly, I misplayed that and ended up on the losing side, but it was close ! That game, I will present in due course, but instead, here is a win that I needed, just to prove that I can still win ! 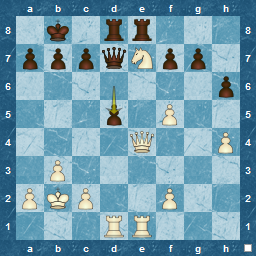 A blitz game, but a nice mate. 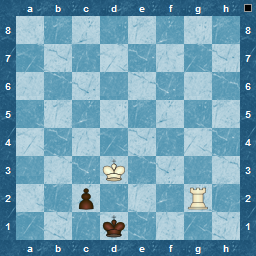 ...where I have no issue with playing a queenless middlegame : I've done it a few times now. 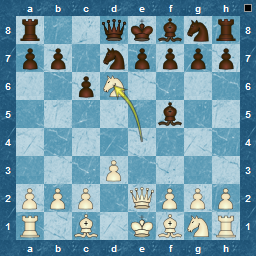 Normally, Bxa2 is quite safe for White, since b3 is a neat trapping move. Unfortunately, this was an exception ! If only I could do this in Team League ! 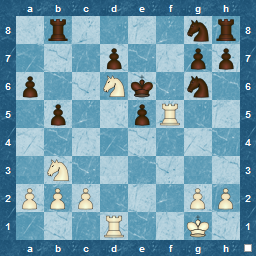 Mess up the next moves and all is equal, but no, I find the correct combination ( Qxd5, Qxd5, Nxd5 ) and although Black plays well, the difference is too much. Mate with Knight, pawn and King ! 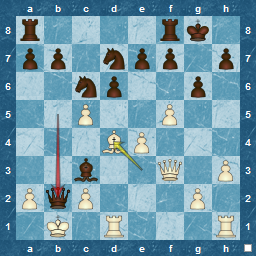 A chess game can sometimes be quite beautiful..
...and what a finish ! Now have the fun of working out what those last seven moves were. What was the author's comment ?
" When you trust the dynamism of your position, you don't need to check all the tactical variations in order to play a sacrifice. Your opponent has to have his eyes everywhere, and this is an even more difficult task, if not an impossible one"
Not too much to say. I played two games this weekend and in both had an excellent position, but failed to win either. The failure is in forming a middlegame plan to continue with an attack, and then, after a small mistake, floundering and making more serious ones afterwards. 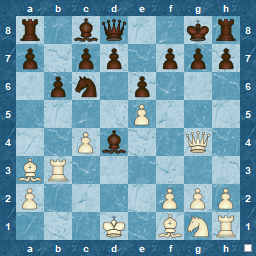 I've just played Re2, to which White has replied Bd1. Not the worst position, but I did have a great move instead of Re2, plus another opportunity to play it, but just completely missed it, despite "knowing" the plan for Black overall : it simply slipped out of my mind. To progress past this, I need a big effort around planning and attacking ! Losing games like this is not good for the team, so I really need to improve and have it under control, or I would guess that the substitute's bench is where I will end up ! 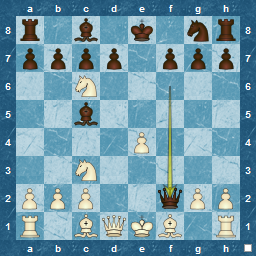 Inspired by a comment from ChessAdmin regarding how Nbd7 in the Caro-Kann can lead to the type of mate I showed as the shortest in T50, I searched all of T4545 for a shorter one. It wasn't there, but I did find ones that are just as short ! 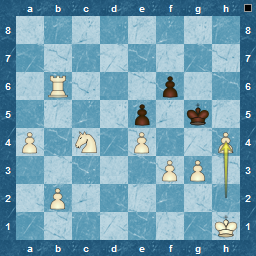 Here is number 2, also 6 moves, also a Caro-Kann ! 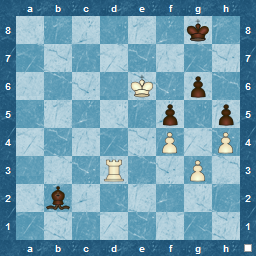 Quite a few short losses, usually, like the one below, because of a blunder losing a piece. Here it is the loss of the Queen, quite understandable to resign ! Enough, I need to make this personal ! Here is my own short loss. 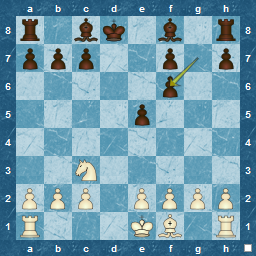 Let's stay personal : my own short win, where White misses the threat. All patsers are similarly guilty ! Finally, no win or loss, but the agreed draw where I wish I had played on. I suppose this is a disadvantage of team games. Once the result of the match is already decided, sometimes one, or both, players lose the incentive to play. Such was the case here where my Hanham Philidor was challenged by the same player, and in the same variation ( Larsen's with g6 ) where I had previously drawn with him. Last time he played 12.g4 and we drew after a hard-fought game. 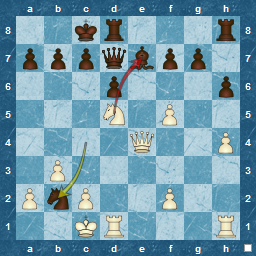 This time he played 12.e5, and agreed a draw : I wish I had played on ! Is it worth adding that these shouldn't provoke "opening phobia" in anyone? Of course not, unless you play an early Nbd7 in the Caro-Kann, but then, you are prepared, aren't you ! 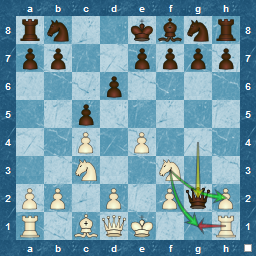 One of the draws was an opposite-bishops ending, played as such from move 38.: dedication and stamina ! Black has just played 5...Ngf6, and White does not make a mistake ! Just how the Caro-Kann should be disposed of ! 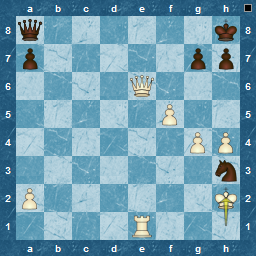 White to play and win ! See also T50 Short Games. For some reason, I am quite excited by the new TL4545 season : T51 to be precise. Not quite sure why, maybe its that I haven't played slow chess for some time, and am eager to see what I have lost ( or gained ) in the time away. Although actual pairings aren't quite out, I can see that I will, yet again , not meet fellow blogger and ex-team mate Scotch Yeti during the initial rounds : his various teams are in different divisions to me ! Worth checking out his blog. This time round, it's probable that I will be playing more U1800 games, rather than just the U1600. It doesn't make that much difference in the sections. 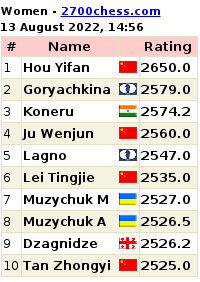 The number 1 boards are generally quite high in rating ( and hence a bit tough ). Board 2 is also regularly a good proposition, but boards three and four can be quite variable, depending on the makeup of the teams. In the U1800 it looks like a 50/50 chance for me, as opponents are either roughly equal or greater in rating. For the U1600 it seems that all opponents on third board are more or less equal, so some good games ahead ! Here's to the next few weeks of good chess ! I've not looked at these yet, but Convekta ( Chess OK ) the creator of Aquarium and Chess Assistant, have a new all-encompassing series of chess courses available. Actually, they don't describe the course content as new, just the technology : fully web-based, and usable on any type of device, PC to tablet. As a taster, there are two of them for free ! Anyone tried them yet ? Another TL4545 is drawing to a close, and, unfortunately Magnum Ignotum are not among the championship contenders. No matter, it was an enjoyable tournament, although for me, since I didn't play the last two rounds, it was shorter than usual, with a grand total of 4 games, all played in August. I don't consider myself obsessed with the openings (certainly not from a Chess sense, although maybe from a statistical point of view ! ), but having started out looking at them via T47, I thought I may as well post an update and a T50/T47 comparison, ie ask the question "Have things changed much in 3 tournaments and almost a year of elapsed time ?". However, before that , what happened from a personal point of view? and does this match the statistics overall ? 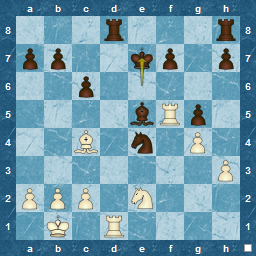 As White, I kept up the banner of 1.e4, playing it in all my 3 games, but how was I answered ? Black has played 45...Kf7. White is ahead in material, and to play...any ideas ? The game continued as below ( highlight between the brackets to see), and fizzled out to a draw, but I think White can do better. Although the post title could well refer to this blog, since I have been a touch inactive with updating it in recent months, it actually refers to Sverre's Chess Corner, which has been quieter for even longer ! I'm glad to see it back - sneaking under my radar whilst I holidayed - as it always has interesting posts, and Sverre Johnsen actively replies to reader comments, making it a worthwhile place to visit. It also has a "sister blog" of book reviews, which is updated very irregularly, but the reviews are excellent, and are just what I would want to see. In fact, although I think I bought it before I saw the review there, his coverage of Bauer's Philidor files also has a couple of options not explored by Bauer, that I have since tried. So, not only a review, but hints too ! He mentions that his current project is a book on the King's Gambit, focusing on the Nf3 option for White ( the King's Knight Gambit, I presume ) , and is happy to point out the forthcoming competitors in the publishing world, which I find a plus point for his blog. It will be good to see progress on this. I don't think I am a White King's Gambit player, but who knows. If this is as good as his Dutch Defence book, then I could be converted ! Regardless, its good to see him back. As for me, chess took a back seat while life ( in the shape of work, the past, and holidays ) interfered, caught up with, and soothed me. I intend to put some more posts up with (relatively ) recent games and other relevant and irrelevant thoughts, although we all know where the road of good intentions leads to. This year's event went to a play-off, after both Short and Adams ended up with equal points after the classical rounds. Adams forced a draw as Black in the first game, but as White in the second he took his advantage and carried it all the way through to a win against Short's Caro-Kann. 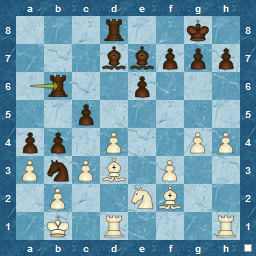 I watched both games live and although I didn't completely understand the second game, it was evident when watching that White had the advantage and kept it. A better explanation than anything I could do is on Dennis Monokroussos' blog, where you can also see the game with his notes. Congratulations to Adams who is British and English Champion, and also to Jovanka Houska who retains her British and English women's titles. Did this make the media in the UK ? Well, yes, but not for the chess-played reasons. Full results and PGNs here. I should also add a well done to Will Taylor, who is progressing well on his Road to Grandmaster. A credible 28th placing in the Major Open, and a Tournament performance, well above his current rating. Looking forward to some good posts about his games and experiences there. I wished for an interesting opening, and both GMs co-operated today to produce a club-players opening with the Italian Game ! Doubtless there are many practical reasons why they do this. Perhaps wariness ( or even weariness ! ) of preparation and technical novelties, or maybe just a desire to play a more standard middle-game. I don't know, and I am certainly not the person to comment ! Regardless, this was an enjoyable game from my point of view. I started following this from work and later I even managed to catch the live commentary from a rather excited Andrew Martin ( and with better sound today ). Here, with Adams short on time, the recommendation ( which seemed good to me ) was 31. h4, with the idea of a solid positional move ' turning the screw' as Martin put it, and forcing Adams to think more, use time and find a plan for Black. 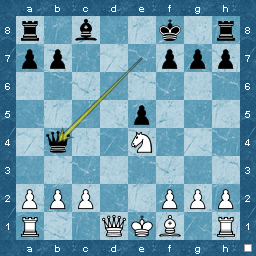 Unfortunately, Nigel Short chose 31. hxg6, and after 31,...Qb6+ 32. Kh1 Qxh6, Black seemed to gain activity and after 15 more moves of manoeuvring, they finally agreed a draw. For me, it was interesting to watch, and very interesting to hear the advice, ie in time trouble, make moves that, although they may not be the best, force the opponent to use clock time and also to think. Simple tactics ( or checks ) just help the opposition and allow him to gain time. So, possibly not the most important theoretical struggle between Grandmasters, but an enjoyable game. The other games that excited the commentators were Hawkins-Conquest ( where Stuart Conquest's play was described as 'unorthodox' and 'Réti-like', although he made a mistake and crashed out quickly ) and Houska-Pert. Here, the excitement of finding a win ( or certainly a winning combination ) for Houska, was replaced by disappointment when she didn't follow through, later putting herself almost in zugzwang, and so effectively slipping into a losing ending of Rook + pawns vs Knight + pawns. She resisted well, but Pert's technique was more than good enough to win. Again, the interesting comments as to why she played as she did, was that it was her style to play more quietly and solidly. A more active or attacking player, they thought, would have played the winning continuation. Great players, they observed, are able to switch styles of play to suit the position : surely a good attribute for any chess player ! Looking forward to the next round tomorrow, with the leaders Adams and Short probably meeting the third and fourth players, Gawain Jones and Nick Pert respectively. I reckon the Pert-Short game ( if that is the pairing ) will be the interesting one, as both are playing well at the moment. By the way, for those bloggers following the Road to Grandmaster's Will Taylor ( Oxidised Lizard to T45 Leaguers ) he is also playing, but in the Major Open. A great start saw him matched against higher-rated opponents in the last three rounds, and his early wins have switched to draws . Even so, he is putting in a good performance with a Tournament rating much higher than his current. Good luck to him in the next round, and here's hoping we see some of his games analysed on his blog ! Short has White, and I hope he pulls out one of his less mainstream openings to give us an interesting match tomorrow, just as he did in round 1, with a Caro-Kann as Black. David Howell is keeping up with them ( he also won today ) but is half a point behind. Among the peleton following them is Jovanka Houska, known for her excellent book on the Caro-Kann and also Nick Pert, who redeemed himself today, after a shameless 9-move draw with his brother in the previous round. Here it is Summer, fewer people at work, edging into komkommertijd. Not much chess going on for me personally, but quite a few events. I was particularly taken with the British Championship. This time around is the first time Michael Adams and Nigel Short have been in it at the same time, and it looks like they will face each other fairly soon as they are currently second and third after David Howell. 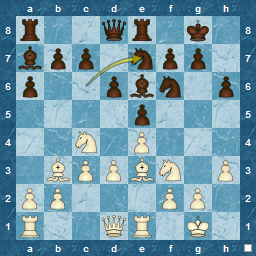 An interesting post with a good endgame position to work out, as well as a fine learning point. The comments contain a good view on a solving thought process as well. As the answer is also on the post, I reproduce it here, so you can have a think before dropping into the excellent Gregg's chess progress. I played the first match of my new T9030 tournament and after a long and tough game, I came away with the win ! Although slightly lower-rated than me, I certainly gave him all due respect as not only does he know his opening ( he seems to play the Caro-Kann exclusively as Black ) but I also saw some of an earlier game with him against fellow blogger Scotch Yeti, and was impressed by the way he fought back, and then held on for a draw. 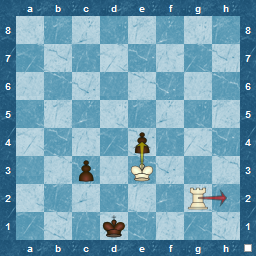 More details on the game later, but it can be summed up as White missing an early tactic to go up a pawn, then undergoing a long period of pressure as Black attacks the opposite-castled white king. Finally, Black perhaps presses just too hard, mis-calculates and loses the exchange. This gives white far more space and activity, and leaves Black with practically no counter-play. A further mistake cost him his Rook and the game. 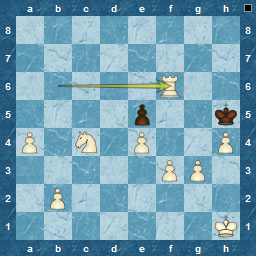 Here is the critical position, where I correctly calculated the exchanges and gained the pawn..
A satisfying game, that I will enjoy analysing and will post later. 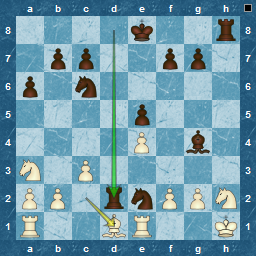 Here's a position from a very recent game. Arising from some variation of a Modern Defence, the game has been more-or-less level so far. 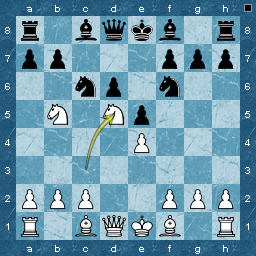 Black has just played Nb4, leaving White with a nice combination, which I actually saw and played ! I am also tempted, but there is already so much chess information available through the internet ( numerous blogs, as well as semi-commercial sites and videos ) and I haven't seen any reviews from the blogosphere about it. 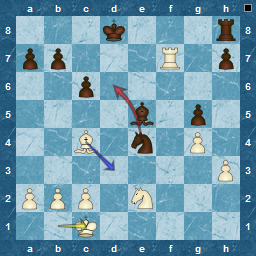 However, this week Chessvibes have made available some sample pages from a couple of published issues and at first glance they appear to be useful enough with diagrams and plenty of written explanation and not just reams of variations : great for us amateurs. Definitely worth taking a closer look. UPDATE: Dennis Monokroussos reviews the original and now latest training pages with a recommendation ! Blogging during this last TL season has , for various reasons, not happened. So, now that the Team is out ( sadly, we didn't reach the playoffs this time ) I will review my season in general here, and discuss a couple of interesting games in subsequent posts. 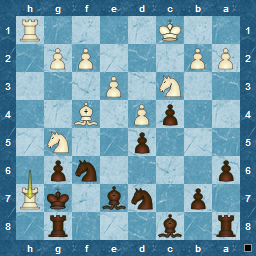 Surprisingly, two of this season's wins were with Black, and both of them against the Spanish ( Ruy Lopez ), as this season I switched away from my normal Philidor Hanham, to more classical Open games. 1) Time Management. Not perfect, but no time scrambles, and a good feeling overall. The latter is most important. 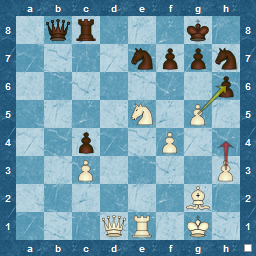 There were at least two games where I blundered terribly. 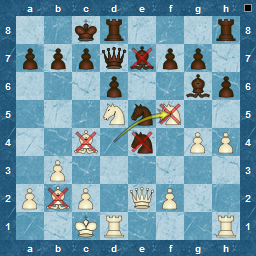 There is an enjoyment as an e4-player in beating the Sicilian. It's probably in-built, a cult memory, like Northern Europeans drinking beer in preference to wine. If ( maybe, when ? ) I play the Sicilian, this is the option I would choose : an early e5 and the Lasker/Pelikan/Labourdonnais variation, challenging in the centre immediately, just like a recent opponent. Wonderful ! Lasker variation and no pesky Sheveshnikov !! I can play Nd5, expecting Nxd5, but wait : Black plays the very bad Be7 and there follows a downward spiral of exchanges for Black, with Nxe7, Nxe7, Nxd6+ . He drops a piece, and finally we end up here, with a Queen check. Oops...next move, 14. Qd8 mate....sometimes you make your own luck ! 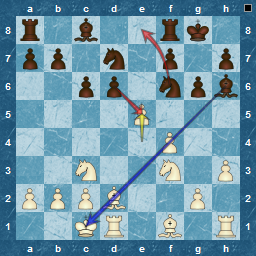 Partly, I wrote this post to offset against this one on T47 openings ( I wouldn't want to be classified as an openings freak :) and to continue my exploration of T47, but also because I was interested in just what sort of endings are played in TL games ( especially compared to 'professionals') and maybe just a bit on trying to identify what endings I should concentrate on, to shortcut trying to work on them all. Presentation was an issue, since, although endgames are classified, they aren't as straightforward as openings ( ie not recorded in the game notation ), but I used a 'standard' classifier in my database, so at least I present some sort of consistency. 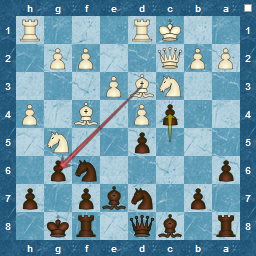 In this position, the correct move ( apart from resignation on Black's part :) is Kg6. However, since the game is technically, well actually, completely lost for me, there is only one move for the swindler : Kh5. Happily, a greedy White player falls into the trap ! Stalemate : its a brilliant last weapon, and so irritating in positions that are completely lost !!! Magnum Ignotum fell at the last hurdle...the last result deciding the playoffs was the expected one that left our chance of the wildcard spot at the mercy of the rules. 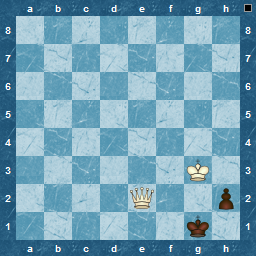 We were level on match point, games points and forfeits with the next team ( King, Pawn and Rook ) who had led their section prior to this game, so I guess it was the fourth board reduction rule that we lost out on. Good luck to them in the playoffs. Shame, but at least some sort of chess break before the next T4545 ! ...where White is preparing to finish things. So what is Black hoping for ? 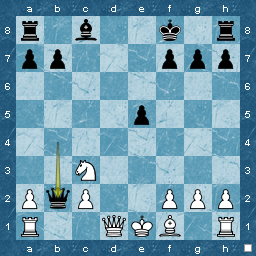 what should White NOT play after Black's next move of h6 ? It's been a while since I blogged : business travel occupying me, with many thousands of kilometres now clocked up, mainly because of two 12-hour flights, halfway across the world ! However now that I have all that behind me, I'm back into the last chess games of the present T4545 season. The Magnum Ignotum U1600 team has not quite made the playoffs. We have to rely on other team's favourable results as well as winning ourselves, and , although there are still some games to finish, I think that we are out. Magnum Ignotum U1800 is a different story. We are second in our division, but might go through to the play-offs as "best second place" or similar. Again dependent on final results of other teams In my own case though, 3 games played in the last week for the U1600 : 2 losses and finally, a win, which I will show here since it is the freshest game. A surprise for me. Reconnaissance had prepared me for a Sicilian ( my opponent's recent outing ) a classical e5 reply ( the most likely ) or, from very old games, a French. Imagine my surprise when 2...d6 was wheeled out after e5 and I was White facing the defence I play most as Black : the Philidor ! I seem to have carried on looking at T47 games after my brief exploration of openings played. If I manage it, I hope to give details of some of the endgames reached, but while assembling this, I saw a number of under-promotions in a few games ( 11 of 1377, to be precise ! ). Most of these are irrelevant, ie under-promotion makes no difference to the result, as the 'promoting side' was in full control. I suspect, in fact , that a lot of under-promotions are just to allow practise in unusual mating, especially if the opponent doesn't resign. There was only one that was a necessary under-promotion, since creating a Queen would be an instant checkmate next move. Amazingly, Black must have thought his luck was in, as White played Kh4, and it took until move 160 before mate happened. Doubtless time trouble, and the "forking ability" of the knight is something to be wary of. 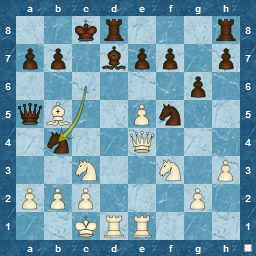 Again, promotion to anything but a Knight will result in mate, but 64...c8N+ is a great way to gain a draw, and on the magic 64th move ! 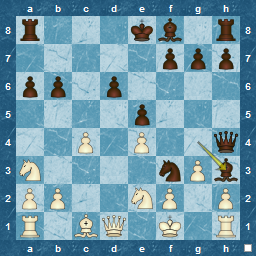 Interestingly, go back to move 63 in the same game, and White misses the chance of a win. It wasn't time trouble as both players had plenty of it, but I think it was an assumption on White's part that the win was guaranteed. Does it matter which move you choose ? Kxe4 ? or Rh2 ? 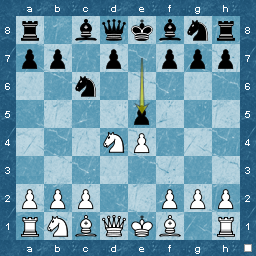 Dave Regis gives a 10-minute guide to the French Defence at the Exeter Chess Club Blog. 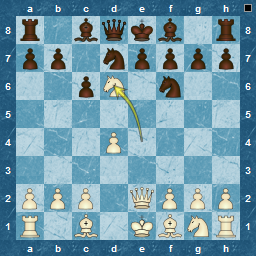 This great site contains lots of simple and sound chess advice and is highly recommended. On the same defence, but taking a distinctly 19th century view of it, are these two posts from the Kenilworthian, that make interesting reading. 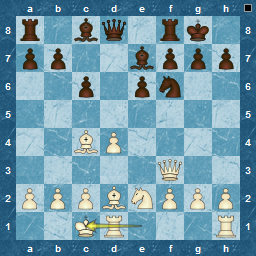 I have to admit Labourdonnais seems to have played some interesting chess all those years ago. He has a line in the Sicilian named after him and I have seen his games in the Queen's Gambit Accepted ( especially in the match against McDonnell ) also quoted as being good examples. I played in the Monthly Standard at ICC this week, and had a see-saw ride, ending up with drawing a game I should have won easily. My opponent was rated 300+ points above me, which I guess is why he elected to exchange Queens early against a weaker player. However, I've been there in the Philidor a few times before, and it is no longer scary ! ...instead of Rxe5, guaranteeing a win ! Following Rxf7+ he exchanged Rooks on d8, but misses the deadly Black Knight fork riposte on d6, as well as the recovering White moves of Bd3 or Rf3 ! Not matching his rating in his tactics. 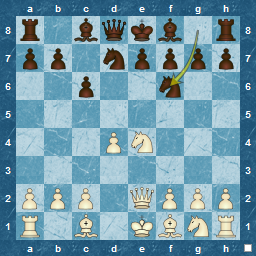 I should have played Kg5 losing the Bishop, but defending the pawn for another chance. Although I had further opportunities, with time running out I managed a draw against his much more effective technique. Disappointing overall, but good to see higher-rated players making the same mistakes as me. Improve my tactics, formulate and follow a plan ( in this case creating a second weakness ), practise the endgame, and there is hope !! ...is hosted here on Brooklyn64.com. Just like like the January, some interesting posts to view. I had forgotten about Mark Weeks' blog ( as opposed to TWIC, which I visit regularly ) and he has a good post entered. I should also mention that this blog has an entry for my post on T47 Openings :a lot of visits happened yesterday ! My weekly ChessOK RSS feed tells me that a free course "Play like Botvinnik" is available at Chess OK. I own the similar Lasker offering ( in the Play like a World Champion series ) as an 'old-style' Convekta course, not the new Peshka version they are offering. I suspect the content is the same, but the interface will be different. Certainly worthwhile, especially as its gratis ! Yes , I guessed it even if you didn't ! I should have placed my bet, as Yasser Seirawan's "Chess Duels" was the winner. You can see a blogger's short review, a slightly longer Chessvibes one, or grab it for yourself at a discounted price here from my favourite online book store. solution here) is actually much more than famous, its seminal ! Relatively recently, I discovered Lubomir Kavalek's blog on the Huffington post ( itself an interesting amalgam of newspaper-style reportage ). He's interesting , with a colourful past, and writer of one of the longest-running newspaper chess columns [ from the Washington Post ( 1986 - 2010 ) ]. 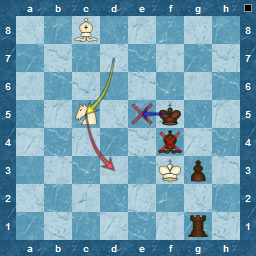 In this older post he gives the endgame puzzle with a bit more on the solution than me, showing the 'queening square' that the study is based around, and augments it with others from composers that used Réti's fine idea. Worth a look, along with his other posts. 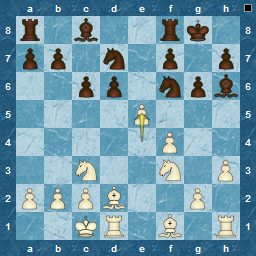 As an exercise, its worth setting up the position and playing as White against an engine...educational, and excellent practise. In addition here's one of my recent endgames. 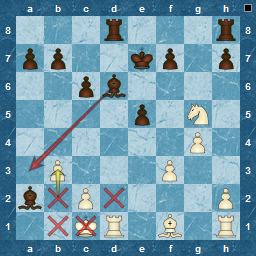 The same theory of the 'queening square' applies ( modified of course by the f2-pawn). 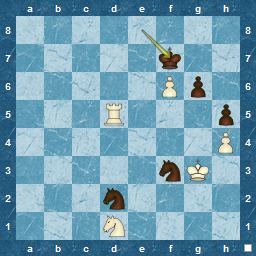 In the game White played the wrong move, and after Black's d4 realised too late that he could not stop the queening operation : a successful swindle on my part ! 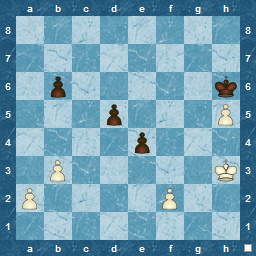 Can you win as White ? When I saw the headline "Chess Protegé : I'm just a normal teenager", I thought this was another story about the relatively 'normal' Anish Giri, or even more likely, a focus on Ray Robson, the teenage American who, at 15, had his biography published ! I knew it couldn't be about Magnus Carlsen, as he is no longer a teenager ! However, it was a very pleasant surprise to read about Hou Yifan, at 16, the most recent Women's World Champion. You can never really tell with journalists, but here Hou Yifan comes across as a real person who has succeeded simply because she loves chess, and has worked hard to nurture her talent in it. I might have predicted the winner ! I go for the Chess Queen, on the basis that we have enough 'strategy guides', Seirawan is bound to win something else, and its written by a World Champion ! Shame that my nomination, Colin Crouch's "Why we lose at Chess" didn't make it through, as its an excellent educator, and a decent "real games" collection as a sideline, mainly of Colin Crouch's own, which, since he was analysing after a period away from the game as a way of re-assessing and re-gaining his own chess strength, is extremely useful for any aspiring chess improver. For a better review than I could give see here. It is probably fair to say that it could be a better book, but as its about my sort of games, and improving from them, I am happy to accept it as it is. Make your mind up and then go and buy it ! However, if I was a betting man, my euros would probably be placed on Chess Duels, whose author needs no promotion from me ! "Time spent in reconnaissance is seldom time wasted"
Well, true, but sometimes, you just wish your opponent would follow the same plan as yourself ! In checking out the opposition before playing this back in March last year, I could guarantee that my opponent played 1.d4, a move that I don't particularly enjoy meeting. Mostly, I have responded 1...f5, the Dutch, which has been relatively good to me. 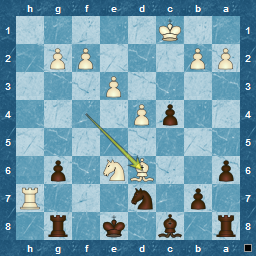 However, I recognise that its not quite as flexible as some opening moves, and can also be quite particular and precise, so its probably better, at this stage of my playing, to aim for more main-line openings. When I played chess as at school, the King's Indian was the opening that we all wanted to play. No sensible "chess reason", but mainly because it consisted of a 'fianchetto', which sounded incredibly exciting, let alone the "Indian" part, which was exotic too. I can't recall if this was also prompted by players at the time, or, as is more likely, it was based on the influence from the school chess club teacher, whose name I can't even remember !! Mind you, I must have inherited a cult memory, or 'desire' to use it, as I have played it a few times over the years, but never really invested time in learning what it was all about. I used to play the Old Indian variation, probably because of either romantic notions or a (wrong) belief that it was so obscure that no-one would know it: how many of us amateurs do that ? Enough of memories, and onto the game in question. The Chess Cafe web site is running its Book of the Year contest. My nomination is for Colin Crouch's "Why we lose at chess", which I enjoyed last year. Another nominated book that I read was Karpov's "Find the Right Plan". Its not had the greatest reviews, but I was fine with it. Most other books nominated, I haven't read. My guess is that, if he doesn't win this Chess Cafe vote, Yasser Seirawan will win someone's book-of-the-year for his "Chess Duels", as there seems to be too much "groundswell" about it. I've not read it, nor any other of his, so I have no opinion to state ! Looking forward to the votes and next round. A round up of my T47 season is here and I have little to add, except that I enjoyed all the games, particularly those in the U1800. My league rating has dropped a small amount from 1600 to 1592, which implies that I am probably playing at an appropriate level over the past 4-6 months. I feel I can do better, so, along with many others will state the intention to try to do more 'chess study' with the idea that I do actually improve, either ratings-wise and enjoyment or even in some other unmeasurable way ! The obvious route is tactics and calculation, as I plainly miss many combinations. 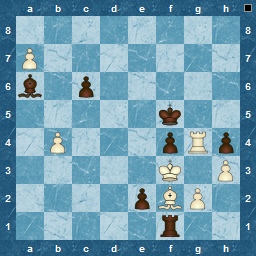 Other areas are general endgame knowledge and technique, and what I will call positional "know-how". In practice this 'know-how' may boil down to learning some standard positional plans and techniques, such as the 'minority attack', or 'playing against an Isolated Queen Pawn', with the intention of actually understanding what these mean ! As to posting a regular update...I will have to see how it goes. I have many good intentions, but as we all know, sometimes all these intentions do is pave the road to hell. In the end a bit of an anti-climax, as my game was redundant, since no matter the result, the team would be out : the effect of one too many forfeits in the main rounds. I again pulled out a Philidor, but as my opponent was not that interested in playing, after 12 moves we agreed a draw. Not very honourable, but when someone doesn't want to play, there's not much to do ! In his parting comment White suggested that he was ahead, but I disagree. I'm sure there is an edge to White, but Black has either dxe ( with some interesting forcing options ) or Ne8 ( with a slower game ). 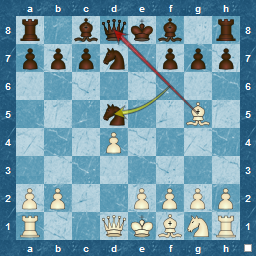 I had decided on Ne8, but now I think that the more direct dxe is the better move. Previously, in fact against the the same opponent, I had seen 12.g4, which I'm not sure is much better than e5, but I made a mistake and allowed a dark-bishop move hitting my rook on f8, that also uncovered an attack on d5, forcing me to lose a pawn. The same bishop-move threat is present here, but I think dxe defuses it. Plenty to think about, but for now, the next move is to recruit a reliable 5th ( & 6th ? ) team member so we don't suffer forfeit losses in T48. I intend to play both U1600 and U1800 next season, so we will see how it goes.